A three-judge panel from the California Fifth District Court of Appeals ruled that the state Agricultural Labor Relations Board improperly blocked a 2013 election to decertify the United Farm Workers from representing workers at Gerawan Farming, Inc. The ruling called the labor board's treatment of the workers as "either arbitrary or punitive (or both)." The Court found that the campaign to cut ties with the union was an organic "worker-initiated and worker led movement," rather than an employer-sponsored one. "The drastic remedy of throwing out the election in a case such as this one would appear to be either arbitrary or punitive (or both)—i.e., unnecessarily disenfranchising the employees as a punishment for the employer's wrongdoing," the ruling says. The court said the board took an adversarial approach to management at Gerawan Farming, but its course of action came at the expense of its employees, rather than the company itself. Refusing to count the ballots amounted to an attack on employees' rights, rather than company executives, according to the appeals court. 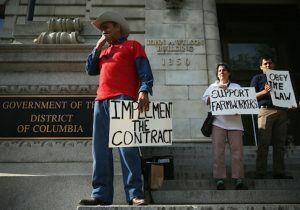 The court said the agency is designed to safeguard farm workers, rather than organized labor. "The Board so narrowly focused on punishing the employer that it effectively lost sight of the correlative statutory value of protecting the farmworkers' right to choose, which was and is a fundamental part of the Board's mission," the ruling says. "We believe the Board's one-sided approach constituted legal error." The company celebrated the decision, calling it a victory for employees. Company co-owner Dan Gerawan said the labor board's actions deprived his employees of their voice in the workplace. He praised workers for fighting to have their election recognized despite bureaucratic interference from the state. "This is a victory for our employees," he said in a statement. "They never gave up on their struggle to achieve the same rights that all other workers have, and we never wavered from our support of their right to choose." United Farm Workers spokesman Armando Elenes said the decision was "disappointing," but hopes the ruling will be overturned on appeal. Elenes said the Fifth Circuit Court of Appeals has a track record of siding with management in decisions that are later overturned by higher courts. "The decision from the Fresno Court of Appeals is disappointing, but not surprising. The Appeals Court's pro-grower rulings have been unanimously overturned three times in the past year by the California Supreme Court because they ignored well established rules of law," Elenes said in an email. "The United Farm Workers plans to seek review of this decision with the state Supreme Court and is confident it will also be overturned and that farm workers' rights will be respected." Labor watchdogs also called the ruling an important victory for California workers. Patrick Semmens, spokesman at the National Right to Work Legal Defense Foundation, said the move to block the tallying of the votes was "outrageous." It also reflected the impartiality of many labor arbiters who see their jobs as defending unions rather than workers. "It is outrageous that after workers voted in 2013 seeking to remove the UFW union from their workplace, it has taken an Appeals Court ruling just to order the labor board to count the workers’ votes," Semmens said. "This entire case shows how labor law is stacked against the rights of individual workers, whose freedoms are regularly violated in the push to prop up union officials' power."